What’s it about? Three years ago, a major section of Tokyo and everyone in it disappeared, leaving behind a crater known as “Lost.” The only survivor, Yuki, has been held by the government for testing ever since. The courier Takuya has taken on a job to rescue her, but transporting Yuki may be more than he bargained for when she turns out to have psychic powers… and so do the people after her! When Funimation revealed that this new series would be called AFTERLOST instead of its English subtitle, Where I End and You Begin, I was ready to raise a stink. Where I End and You Begin is a much more interesting, evocative title. AFTERLOST sounds like it’s trying to bank way too late on a fake connection to the JJ Abrams TV series. Now that I’ve watched the episode, however, I’ve changed my mind. AFTERLOST is a much more fitting title. That’s right, everyone. In a season swimming with mediocrity, AFTERLOST is the first true stinker of the bunch. It’s a mess of ugly design, clunky animation, and poor writing where nothing has any sort of impact at all. The character designs are boring, the CG is about on-par with original-generation Xbox graphics, and everything just kind of happens. Unfortunately, it sidesteps “so bad it’s good” territory by playing Sad Libs with generic story elements and refusing to do anything actually interesting. Yuki is a human MacGuffin/teenage psychic whose powers only manifest when she’s under distress. Takuya is “just doing his job.” There’s an army of super-sekrit government psychics out to stop them. He banters awkwardly with his nerdy best friend/mechanic (literally called Geek) who’ll do jobs under the table so he doesn’t get caught. Yuki as the human McGuffin is easily the most irritating trope of the bunch. She should, by all rights, be the protagonist of the story. She’s the one who survived an unexplained disaster, lost her family, and was subsequently subjected to a gauntlet of government tests. She’s the one who’s receiving mysterious encrypted emails from her presumed-dead father. She’s the one with psychic powers that the government will stop at nothing to obtain. But no, Takuya, the man with a motorcycle and a bad attitude, is the protagonist. He’s just so burdened by this poor traumatized teenage girl. He better be getting paid well! Good thing he has a wry sense of humor about everything she’s putting him through, joking about kidnapping. He grumbles, but really he has a heart of gold—enough to put his life at risk as Organization XIII knockoffs try to recapture Yuki. But man, is it tough when that damn girl refuses to be an inanimate object! Yuki, feeling terrible after he literally calls her “nothing more than a package,” wanders away from Geek’s garage until a psychic tells her to turn back. 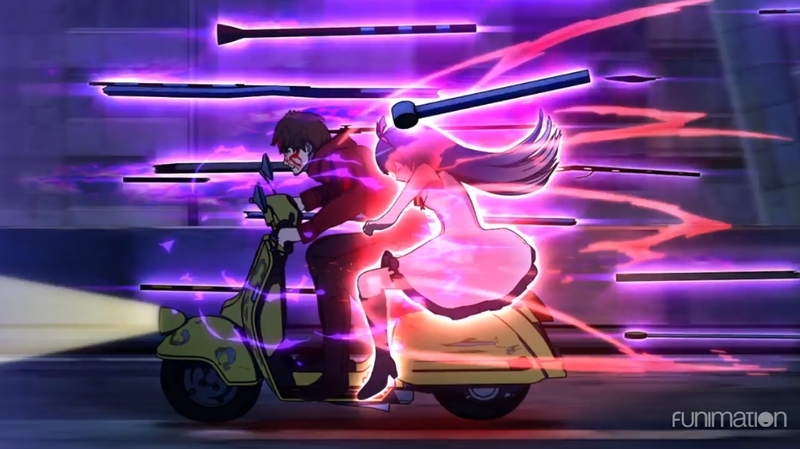 When Takuya finds her, he says, “It’s okay if you don’t believe in me, but you should believe in your father,” and she climbs back onto his motorcycle like a good little parcel instead of an actual human with feelings. That’s not the issue, dude! It’s not that she doesn’t have faith in her dad, it’s that you’re literally treating her like an object! Oh sure, if the writing were good enough to inspire any kind of faith from me, there are character-based justifications for it. Like maybe she’s so used to being treated like an object and being ordered around, she does it without thinking. If anything about this episode inspired that kind of faith, I could run with that. Instead, we’re supposed to think that Takuya’s gruffness is covering up a heart of gold which he shows by protecting her even at risk of his own life. For a series to be “so bad it’s good,” it has to be daring. Interesting. True funny-bad art is messy and weird and doesn’t adhere to storytelling conventions or expectations. That’s what makes it fascinating. So far, what we have here is basically a twelve-episode commercial for a phone game.